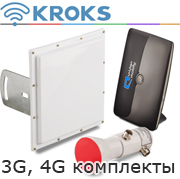 Очень разумные технологические странички -> Радиомикрофоны 2 транзистора -> Передатчик DSB с питанием от энергии голоса оператора. Главная страница -> Спецтехника -> Радио микрофоны, радиожучки. -> Радиомикрофоны 2 транзистора -> Передатчик DSB с питанием от энергии голоса оператора. Радиомикрофоны 2 транзистора -> Передатчик DSB с питанием от энергии голоса оператора. Передатчик DSB с питанием от энергии голоса оператора. This double-sideband (DSB) radiotelephone transmitter is powered entirely by the instantaneous (not stored) energy produced in the operator's voice. The RF output power in my prototype falls within the range of 5 to 15mW. 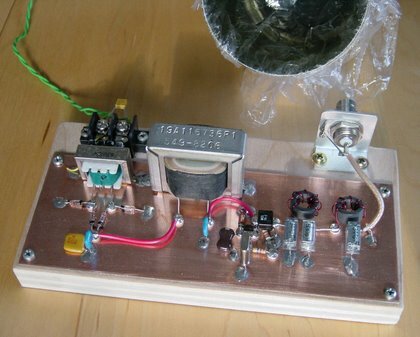 The circuit is essentially a high-level DSB modulator/crystal-controlled RF oscillator. To date, my best DX QSO with this radio stands at 160km/100 miles (please see the station log below). 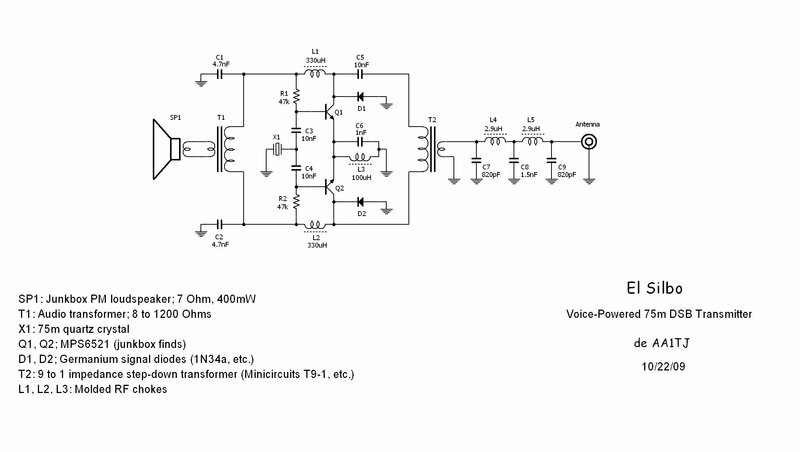 I'm saying, "CQ CQ AA1TJ Voice Powered Transmitter 5mW." I know it doesn't sound like much, but please bear in mind the signal that you hear was projected 245km by the instantaneous power of my voice. A comment about this recording posted to Bill, N2CQR's, Solder Smoke Blog made me smile. "The audio samples are eerie; remind me of those audiograms recorded back in the 1860s...you know, the woman singing the French folksong snippet..."
Thank you, Roberto. Oh yes, I know the clip that you're referring to. You can hear it here. 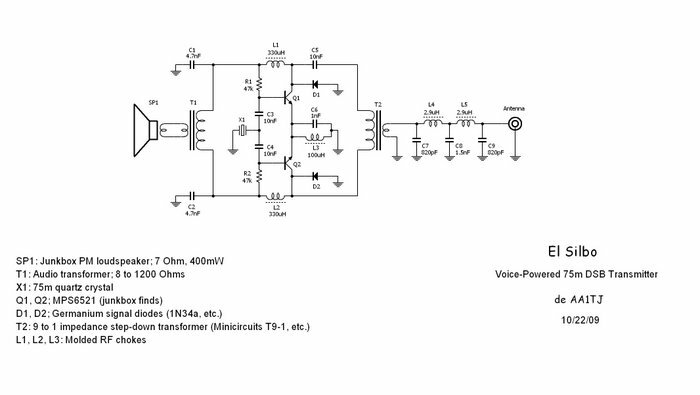 10/26/09; This afternoon I substituted an electret microphone (salvaged from an old telephone) directly driving an LM386 audio frequency amplifier in place of the voice-driven "loudspeaker" (SP1) shown in the above schematic diagram. This produced a peak DSB output power of 100mW (50mW in each sideband). I worked four stations on 75m this evening with this setup. Please click here to hear a recording of my signal made by W1PID (thanks Jim!) at a distance of 109km (the louder signal that you hear at the end is Seabury, AA1MY). Speaking into the permanent magnet loudspeaker, an audio frequency alternating current will appear at the secondary winding of transformer, T1. When the signal on the upper end of this winding turns positive, diode D1 will become reverse-biased (effectively disappearing from the circuit). At the same time diode D2 will become forward-biased, and thus clamp both the collector of Q2 and the lower end of the primary of transformer T2, to ground. The Colpitts crystal oscillator - centered around Q1 - will begin to oscillate (the Colpitts capacitive divider consists of C6 and the active transistor's internal base to emitter capacitance). When the audio frequency signal reverses polarity, Q1 becomes "clamped-off" and RF oscillation will commence in the Colpitts circuit, now centered around transistor Q2. An identical amplitude, but 180 degree phase-shifted, RF signal will appear on the secondary of transformer T2; as it must to insure proper DSB modulation. El Silbo takes its name from Silbo; a whistled language (of sorts) that's used on the isle of La Gomera (Canary Islands) to communicate across wide mountain valleys. The best DX is apparently 2 miles, or just over 3km. The idea for a voice-powered radiotelephone transmitter appeared not long after transistors first became widely available (my thanks to Roger, G3XBM, for unearthing this!). I wonder what became of Mr. Bryan's AM radiotelephone transmitter? "The Army Signal Corps has developed a radio transmitter that needs no energy except electricity generated by the speaker's voice. The trick would be impossible if the set used vacuum tubes, but all it has is a single transistor, which needs only a faint current. 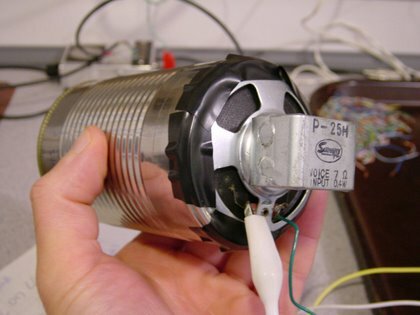 When the speaker's voice makes the microphone vibrate, it generates enough current to operate the transistor and put the voice on the air. The present model, small enough to fit in a telephone mouthpiece, can transmit 600 ft. Later models, says George Bryan, developer of the set, should be good for a full mile. Next step will be to build a voice-powered receiver. It will store up voice-electricity while the speaker is talking, then use it to pick up the answer while he is listening. Bryan believes that the entire outfit can be tucked into a plastic container no bigger than a matchbox. Mass-produced cost: $20." Please click here to view a photograph of George Bryan and his voice powered transmitter which appeared in the December 1955 issue of Popular Science Magazine. You may also click here to download the United States patent issued to Mr. Bryan for this device. 10/13/09 W1VZR 57/459 Limerick, ME 160km 2.5mW Early ckt; resorted to "mouth CW"